A couple of weeks ago we bought a beautiful Rosemary bush. It's over a meter tall and so full and healthy. Ever since, I've been craving some savory sourdough using some of this Rosemary. 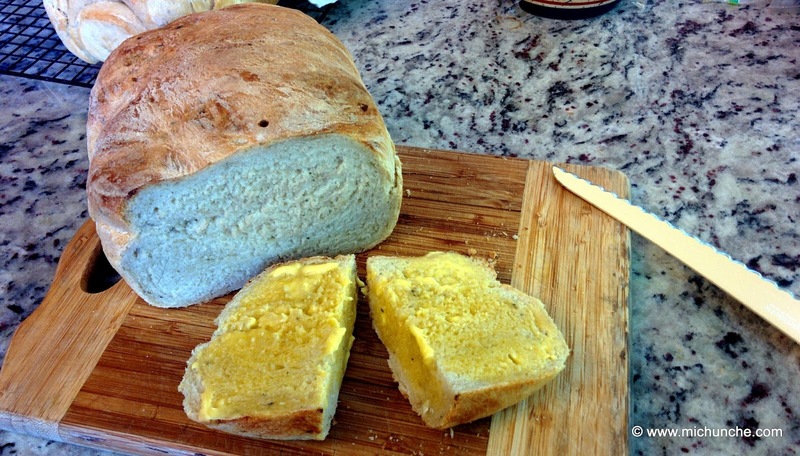 The following is a delicious savory variation of my simple method for making no-knead sourdough bread. The day before you want to bake, remove your sourdough starter from the refrigerator and let it come to room temperature. Then feed it with ½ cup of flour and 1/3 cup of water and let it sit at room temperature for several hours. If you have an active starter, it should double or triple in size. Do not put the lid on too tight, the gases need room to expand. I usually take the starter out of the refrigerator around 7 AM, and then feed it about 10 AM. In the evening I prepare the savory blend, then mix the dough and let it proof overnight. Prepare all above ingredients, mix well and set aside. Mix together the flour, salt and savory ingredients until well blended in a large bowl. Stir the starter very well to release the gases. Dissolve 1/4 cup starter into the purified (filtered) water and add the olive oil. Add the liquid to the dry ingredients and stir until the liquid is totally incorporated. Cover with plastic and let sit 12-16 hours. Gently dump the dough out onto a floured board or countertop. With well floured fingers, gently stretch the dough out into a rectangle about 12” x 9” in size. Fold 1/3 of the dough in on itself, and then fold the other 1/3 on top. Then fold it in half. Cover loosely with plastic and rest for 15 minutes. Gently transfer the dough to well floured towel or proofing basket or bowl. (I use parchment paper in the bowl to make it easy to transfer to La Cloche, or Dutch Oven.) Cover with towel and let rise about 1½ - 2 hours. Bake in covered La Cloche or Dutch oven preheated to 475 degrees for 20 minutes. Remove cover; REDUCE heat to 425 degrees and bake an additional 20 minutes. Check internal temperature with an instant read thermometer. The bread is done when the temperature is between 195° and 205° F.
Remove and let cool completely on rack. Oh my! Butter a slice and enjoy!